The following is a case study presenting the issues encountered and overcome when problem-solving a pyrophoric gas transfer application with KNF customer, Air Products and Chemicals. Air Products is a leading international manufacturer of industrial gases and chemicals. With a staff of over 21,000, the company, based in Pennsylvania, operates in 50 countries across the globe and supplies a wide variety of processing media for myriad applications and industries. Among goods produced specifically for the semiconductor and solar industry, Air Products manufactures a special gas mixture employed in etching and gas deposition processes to coat silicon wafers and glass substrates; these methods help, for example, to create the active films in flat panel displays and solar cells. Owing to their pyrophoric properties, the utmost care is required both when manufacturing and using these gases. All system components that store or transfer the gases must therefore prevent air contamination. Should such gases come into contact with air, an exothermic reaction takes place in which a telltale oxidation product is created and deposited in the form of a white coating. Our “About KNF USA” series comes to a close with its fourth and final chapter, a video snapshot of the Process and Specialty Products division. Richard Aerts, Process Products Engineer, walks you through options for reliable transfer, sampling, evacuation and recirculation of liquid and gas in critical—and often hazardous—industrial applications. To explore further, download our Process Pump Catalog, or see our Process product line. 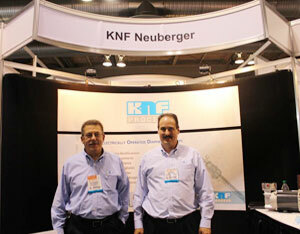 You can view the entire KNF Neuberger video library here.